Roman Polanski’s Macbeth, also known as The Tragedy of Macbeth, is an emotionally charged, grandiose production of Shakespeare’s timeless play. The story of Macbeth (wonderfully portrayed by Jon Finch) is well-known. After a battle in which he bravely fought for King Duncan (Nicholas Selby), Macbeth and his good friend, Banquo (Martin Shaw), happen upon a trio of witches (Maise MacFarquhar, Elsie Taylor and Noelle Rimmington), who prophesize that Macbeth will one day be king, with Banquo’s descendants ruling after him. This bit of welcome news sets Macbeth’s mind to spinning, yet not nearly as quickly as that of his ambitious wife, Lady Macbeth (Francesca Annis). One night, while Duncan is a guest at their castle, Lady Macbeth drugs his chamber guards, which allows Macbeth to enter Duncan’s room and kill the king. When Duncan’s body is discovered, the chamber guards are held accountable, and immediately executed, with Duncan’s only son, Malcolm (Stephen Chase), also implicated. Malcolm flees, and Macbeth is declared king. But the crown does not sit easily upon Macbeth’s head. For one, Banquo knows of the witches’ prophecy, and suspects Macbeth had something to do with Duncan’s death. To quiet his old comrade, Macbeth hires two assassins to kill Banquo and his son (Banquo is murdered, but his son escapes). As a result, the tormented Macbeth is haunted by visions of Banquo, while Lady Macbeth suffers fits of delirium, brought on by the evil deed she and her husband carried out. Looking for peace of mind, Macbeth again seeks out the witches, who inform him he will not be injured by anyone born of woman, a prediction that gives Macbeth a renewed sense of confidence. Even the news that Malcolm has raised an army of 10,000 strong doesn’t worry him, but is Macbeth truly as invincible as he believes? 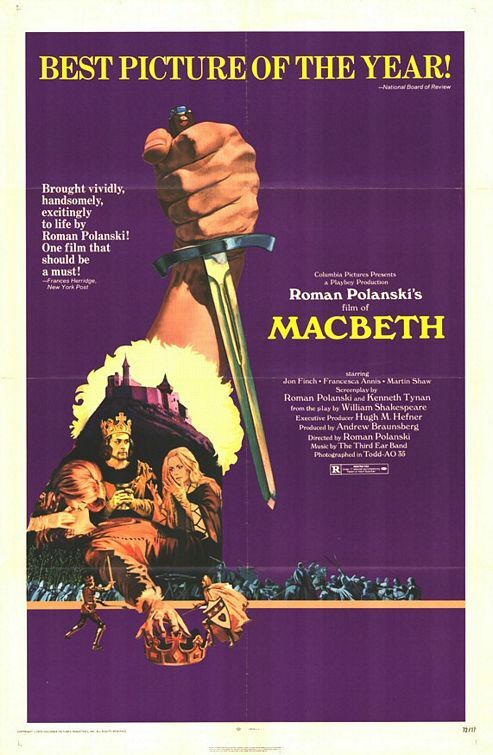 Though not entirely faithful to the play (for the sake of the picture’s running time, several scenes were left out), Polanski’s Macbeth is nonetheless a gritty, unflinching, graphically violent motion picture. The performances are top-notch, especially Finch as the ruthless title character, yet what impressed me most about this version of Shakespeare’s classic story was the look of it, the well-realized settings (it was shot on-location at several castles in England and Wales) and costumes, which brought a realism to the film that effectively transported me back to the Middle Ages. Macbeth has always been my favorite of Shakespeare’s works, and with 1971’s Macbeth, Polanski offers a magnificent retelling of this historical tragedy, creating a movie that does the Bard justice.